Image example Mourinho don lose two out of four league matches for Manchester United dis season. Pipo wey like football go tell you say wetin dem know managers for na to coach dia team, but what if you hear say your club coach dey go prison? Dat na wetin for happun to Manchester United coach Jose Mourinho before im reach agreement wit Spain authorities to suspend im one-year prison sentence for tax fraud. 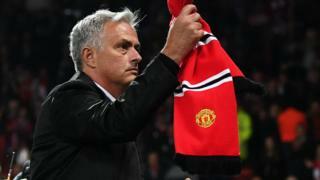 Tori be say Manchester United football manager Jose Mourinho don dodge one-year prison sentence for Spain. Mourinho sign agreement on Tuesday to pay fine of two-point-three million dollars for escaping tax payment. Spain El Mundo tori pipo dey report say dem fine di coach about $2.3 milliom. Authorities for di kontri accuse Mourinho say im dey owe nearly $3.8 million for image rights revenue wey im no declare for 2011 and 2012 wen im bin dey coach Real Madrid. Mourinho no go serve any time for prison sake of say Spanish law no dey allow first time offenders of sentence under two years to go jail but dem go dey on probation. Earlier, di Red Devils coach tok say im pay all di tax im dey owe.